HP is marketing Slate 6 voice tab as – “The tablet you want and the phone you need“. It is said better late than never. Having failed to make an impact before with iPaq and Palm-manufactured devices, HP seems to be ready to retry its hand at smart devices. 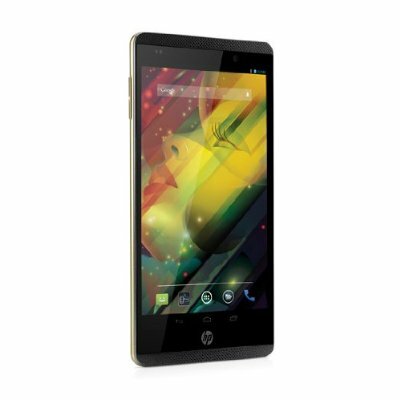 In this endeavor, they have launched a new phablet, HP Slate 6 Voice Tab with a price tag of Rs 22990. This is in line with HP CEO Meg Whitman’s confirmation a few months ago that the company will be heading back in the smartphone business. Assuming that HP can challenge the likes of Samsung and Asus would be too early but it will add to the available options for consumer. Powered by 1.2 GHz Marvell PXA1088 ARM Cortex-A7 quad-core processor, HP Slate 6 Voice Tab runs on Android 4.2.2 Jelly Bean. As is the name, the device has a 6-inch Multipoint Capacitive Touch HD IPS display with a resolution of 1280 x 720 pixels. With 1 GB of RAM and a powerful processor, it promises smooth and slick experience. It has 5 MP auto-focus rear camera with LED flash plus HD video recording support and 2 MP front camera. It has dual-SIM capability with voice call and dual standby. There is 16 GB internal storage with micro-SD slot for memory expansion up to 32 GB. Rectangular with round edges, gold and chrome trims, the build quality does not seem to be cheap. It has carbon fiber scratch-resistant back which feels good in hand. As of now, black colour is the only option available. At 160g, it is also lighter than its counterparts. Other features include Wi-Fi, 3G, stereo FM radio, Bluetooth 3.0 + EDR, GPS, dual front firing speakers with stereo sound etc. An added bonus is 25 GB cloud storage from box.com which comes pre-loaded. Exclusive apps like HP Connected Music, HP e-Print, HP Connected Photo and HP File Manager come pre-installed. Also on offer is 3 months of unlimited downloads on its HP Connected Music service to Slate 6 Voice Tab owners. It surely is a good phone but the pricing is bound to raise eye brows. It would have been whole lot of a different deal had they packed in full HD display and a better camera say at least 8 MP. But given the fact that it packs a nice combo of smartphone and tablet features, this just might be the turnaround HP is hoping for. Being primarily a PC maker, it is expected that Windows tablets will follow soon.